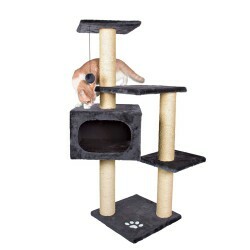 Product Details-Suitable for cats of all ages and activity levels. Assembly required. One year warranty. Dimensions (inches) - 18 x 18 x 56 , condo 13 x 17 x 10, posts 3.5 diameter , platforms 16 x 12 18 x 12 15 diameter, Weight - 37 lbs.Covered in soft plush fabric inside and out, Condo lined with fleece, 6 scratching posts wrapped in natural sisal,3 lying platforms, Color- Tree gray. Product Information-The Alicante Cat Tree will provide endless opportunities for cats to play, explore, scratch or just relax. Felines can sharpen their claws on any of the six scratching posts instead of on your furniture or carpet, giving them a healthy outlet for their scratching instincts. All posts are covered in durable sisal. If a nap or place to hide is in order, the cat can crawl inside the kitty condo. Its covered with plush both inside and out, making it the perfect cozy retreat. Feeling a little spunky Jump, climb or perch atop one of three plush covered platforms and lie in wait for unsuspecting prey or simply enjoy the view.